New Delhi, July 24 (IANS) In the next two years, solar power will be cheaper than the electricity grid in the residential sector, says solar energy provider SunSource Energy which on Monday successfully implemented the first two phases of a 100 MW solar project in South East Asia. Stating that while the solar energy in India has already reached ‘grid parity’ in commercial, industrial and utility sectors, soon this would be achieved in residential sector as well. The grid parity happens when the cost of the electricity produced by an alternative source — solar in this case — becomes lesser or almost equal to that being supplied from the conventional source e.g coal. At present, India has installed capacity of 327 GW (One GW is equal to 1000 MW), of which about 40 GW is Solar (12 GW) and Wind energy (27 GW) combined. About 70 per cent of power comes from coal-based power plants and the remaining from hydro and other sources like biogas. “Solar energy in India has already reached grid parity in the commercial, industrial and utility sectors. In most scenarios, in the next two years solar power would be cheaper than the electricity grid in the residential sector as well,” said Adarsh Das, Co-Founder and CEO SunSource Energy. The solar company has designed and built over 100 solar projects across 18 states in India, with a focus on decentralised power projects. It is currently involved in nearly over 150 MW of solar projects in India and overseas. Its rooftop projects include the India Habitat Centre. 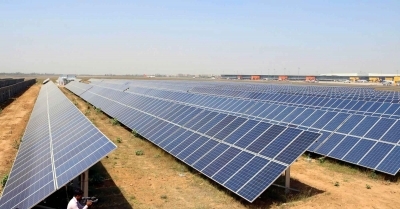 “Aligning with Prime Minister Narendra Modi’s target of 100 GW by 2022, including 40 GW from rooftop and decentralised projects, we are focused on developing, designing and building 400 MW of decentralised solar projects by 2022,” said Kushagra Nandan, Co-Founder of SunSource Energy.